Minister Rabbitte discussing developments within the industry with Bayview Managing Director Barry Cunningham and Project Manager Michael Rogers. Bayview were delighted to host Pat Rabbitte, Minister for Communications, Energy and Natural Resources at their ongoing project delivery at Cherry Orchard Court, Ballyfermot. The project being delivered on behalf of NABCO Housing Association includes the energy refurbishment works within 77 properties and includes installation of high efficiency gas and oil boilers, zoned heating controls (with remote access controllers), solar thermal systems, attic insulation, cavity insulation, internal insulation, windows & doors, CFL’s and draught-proofing. 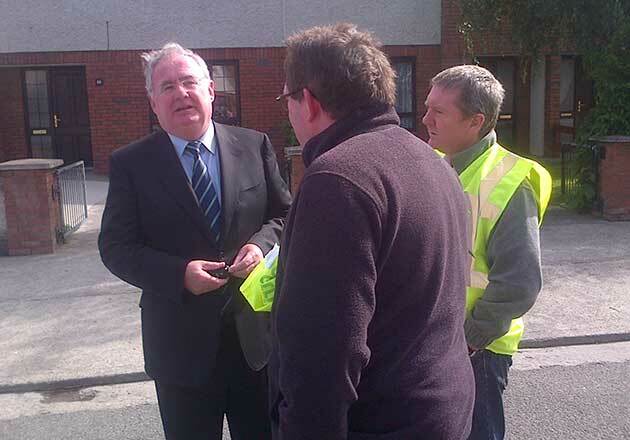 During his visit Minister Rabbitte took time out to speak to local residents in order to gain a first hand appreciation of the benefits of home energy upgrades works delivered through the SEAI Area Based upgrades. He also had lengthy discussions with the employees and management representatives from Bayview Contracts in order to gauge the opinion of a leading contractor on the governments current initiatives focused upon addressing fuel poverty and energy efficiency. 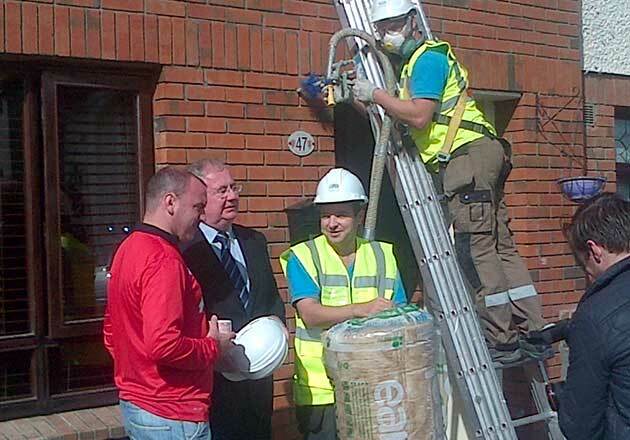 Minister Rabbitte speaking to a local resident, along with Bayview Insulation Operatives Dominic McCrink and John Norris. Click here to read the press release by SEAI on Minister Rabbitte’s visit to Cherry Orchard Court.